Daniel Cross, age 13, shown with his family, has battled heart problems all his life and is now awaiting a transplant. 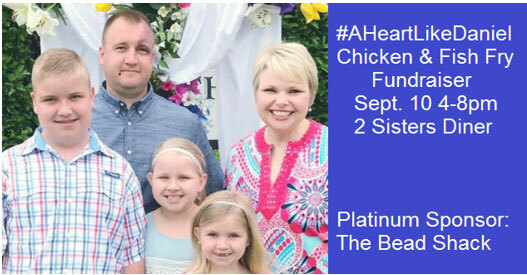 A fundraising event Monday, Sept. 10, will assist the family of a 13-year-old boy, who is awaiting a heart transplant. A Chicken and Fish Fry from 4 to 8 p.m. Monday will raise money for the family of Daniel Cross, son of Jeff and Crystal Cross, who are from the West Union part of the county. The fundraising event will be held at 2 Sisters Diner on West Bankhead Street in New Albany and is sponsored by members of several Union County churches. Daniel Cross was born December 9, 2004, with several major heart defects. He had his first surgery for what amounted to an extensive reconstruction of his heart at age four months. At age 2-1/2, he had a second surgery for further reconstructive work There was no assurance he would survive those two complex surgeries, but they were successful. Daniel has been able to have a relatively active and normal childhood. However, in his 13th year, his heart has begun to fail, and his doctors at LeBonheur Children’s Hospital say Daniel Cross must receive a transplanted heart. He will be 14 years old in about three months. Mrs. Cross says that some possible donor hearts have come available. Daniel’s heart is still responding to medication, so his doctors are waiting for a donor heart with a more perfect match than any that have come available thus far. Jeff Cross has recently retired from the U. S. Navy and is still searching for a suitable job. Crystal Cross has had to quit her teaching job due to the intense care Daniel requires now and in coming months. Thus, the family is in acute need of support. Help from any source will be appreciated. Everyone can help by buying supper, Monday night, Sept. 10, at the event from 4 to 8 pm at 2 Sisters Diner. “We ask that everyone please remember us in their prayers and also the family of the eventual donor of Daniel’s new heart,” said Crystal Cross.